Florence Knoll Bassett, a pioneering designer and entrepreneur who created the modern look and feel of America’s postwar corporate office with sleek furniture, artistic textiles and an uncluttered, free-flowing workplace environment, died on Friday in Coral Cables, Florida. To connoisseurs of Modernism, the mid-20th-century designs of Florence Knoll, as she was known, were — and still are — the essence of the genre’s clean, functional forms. Transcending design fads, they are still influential, still contemporary, still common in offices, homes and public spaces, still found in dealers’ showrooms and represented in museum collections. She was a protégé of the German-American architect Ludwig Mies van der Rohe and Eliel Saarinen, the Finnish architect and teacher and the father of the architect Eero Saarinen. And she worked with the renowned Bauhaus architects Walter Gropius and Marcel Breuer. Throughout her career, influenced by the German Bauhaus school of design, she promoted the Modernist merger of architecture, art and utility in her furnishings and interiors, especially — although not exclusively — for offices. 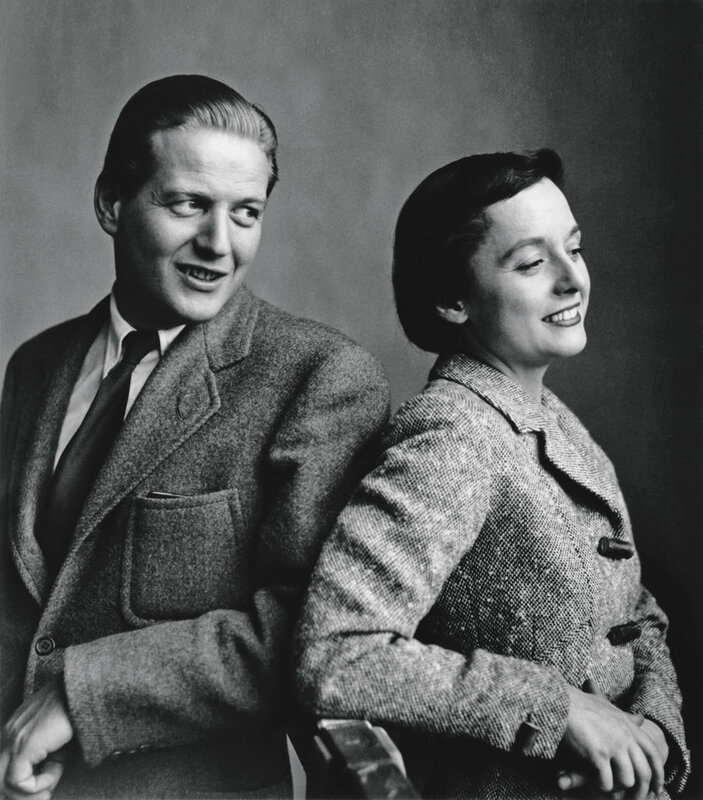 Hans and Florence Knoll around 1945.Image Credit: Via Knoll Inc. 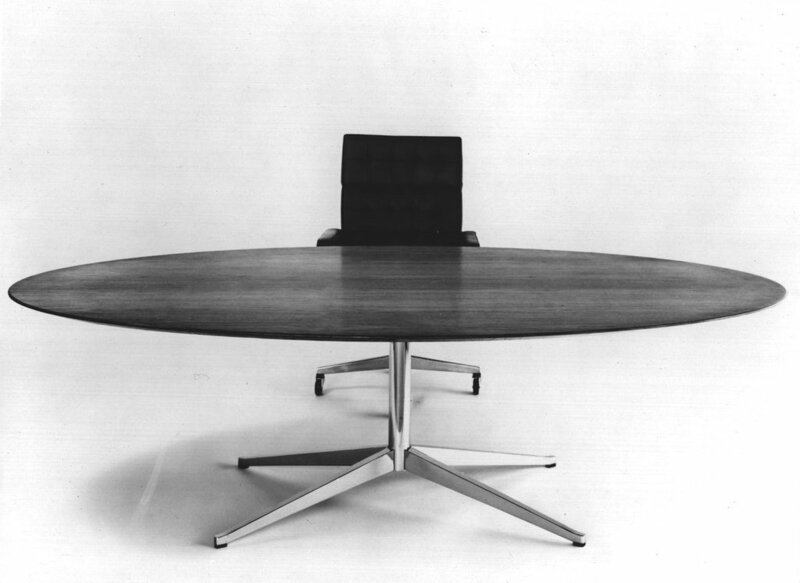 While her husband handled business affairs, Ms. Knoll was the design force of Knoll Associates. It grew to become the leading innovator of modern interiors and furnishings in the 1950s and ’60s, transforming the CBS, Seagram and Look magazine headquarters in Manhattan, the H. J. Heinz headquarters in Pittsburgh and properties across the United States, Europe, Asia and South America, including American embassies. 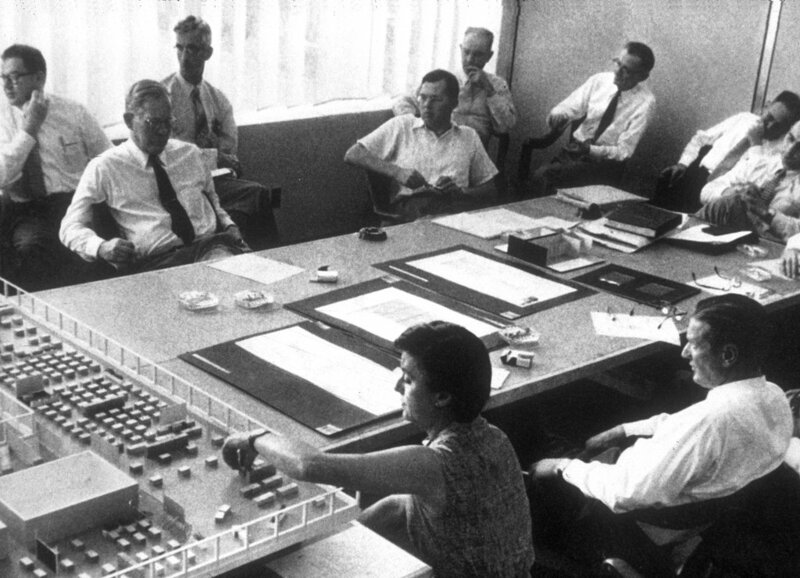 Her “total design” favored open work spaces over private offices, and furniture grouped for informal discussions. It integrated lighting, vibrant colors, acoustical fabrics, chairs molded like tulip petals, sofas and desks with chrome legs, collegially oval meeting tables, and futuristic multilevel interiors, more architectural than decorative, with open-riser staircases that seemed to float in the air. Besides doing strategic planning and designing furniture herself, Ms. Knoll recruited and hired many of the world’s best postwar designers. She staked the sculptor Harry Bertoia to two years in a studio barn to see if, working with metals, he could turn out furniture. His wire chairs became Knoll classics. Even replicas of such designs were expensive to produce, involving some hand-crafting, and retail prices ran into the thousands despite Ms. Knoll’s cost controls. The frame of the Barcelona chair, for example, originally nine steel components bolted together, was designed as a seamless piece of stainless steel, and cowhide instead of pigskin was used for seat and back coverings. But the fruit of that labor became universally known. Some of her work is currently on display at Gracie Mansion, the residence of New York City’s mayor, as part of a yearlong exhibition titled “She Persists: A Century of Women Artists in New York,” spearheaded by the city’s first lady, Chirlane McCray. 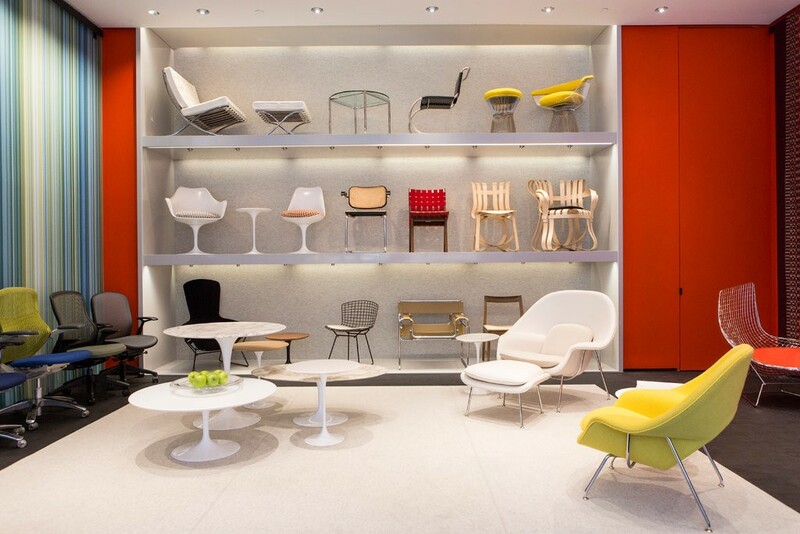 In her last decade at Knoll, the company doubled in size and became one of the nation’s most influential design organizations. Florence Marguerite Schust was born in Saginaw, Mich., on May 24, 1917, to Frederick and Mina (Haisting) Schust. Her father, an engineer and the president of a baking company, died when she was 5, her mother when she was 12. A precocious child fascinated with architecture, Florence was virtually adopted in the 1930s by Eliel Saarinen and his wife, Loja. She attended Kingswood, a girls’ school in Bloomfield Hills, Mich., and later its affiliate in the same city, the Cranbrook Academy of Art, a fountainhead of architecture and design. Both were residential schools for practicing artists, overseen by Eliel Saarinen. His son, Eero, also a Cranbrook student, went on to design the CBS headquarters in New York and the winged TWA Flight Center at Kennedy International Airport. Florence Schust spent summers with the Saarinens in Europe, exposed to a world of art and culture. After two years at the Architectural Association in London, she returned to the United States as World War II began. She was an apprentice for a year at Gropius & Breuer in Boston, studied at Columbia University’s School of Architecture and under Mies van der Rohe, and earned a bachelor’s degree in architecture from the Armour Institute of Technology (now the Illinois Institute of Technology) in Chicago in 1941.